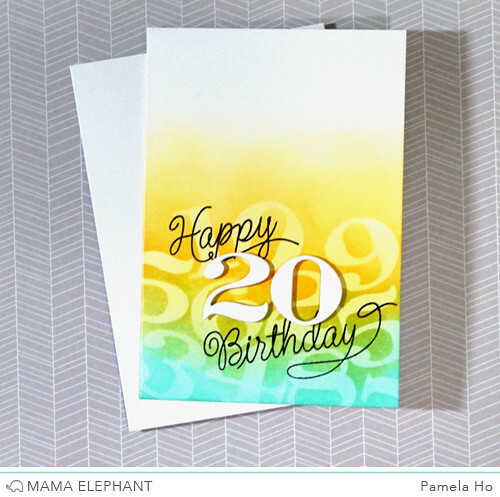 We are on our last day of Mama Elephant’s January release Stamp Highlight and we will be using the last stamp set from the release – Number It as well as the Number It Creative Cuts. This is a perfect set to celebrate all those milestone birthdays or even anniversaries! I first cut out a bunch of number masks with the Number It Creative Cuts and blended some ink onto the cardstock. After removing the masks, I blended some more ink so the white would be less transparent. 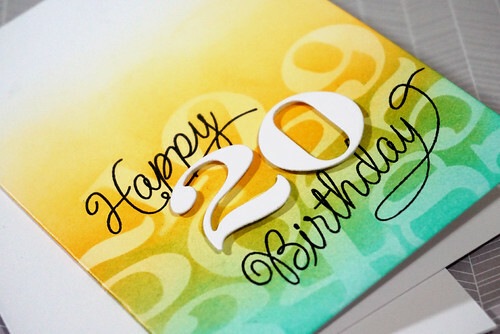 I stamped the “Happy” and “Birthday” from the Number It stamp set and adhered the “20” using foam tape in the middle. Since I’m using white cardstock for the age, I didn’t want the background to have too much white.